Chuuk— In an email circulated to a large group of FSM and international government officials and others, Vikas Bijlwan, a former Padma Enterprises- Saki Store employee from India made several serious allegations of wrong doing associated with the store. He made the claims from India after he was allegedly summarily dismissed from employment with the store in Chuuk on the evening of August 4 and handed a plane ticket for a flight that departed for India just over five hours later. FSM Secretary for the Department of Justice Joses Gallen has dispatched investigators from Immigration and Labor to investigate the claims. In an online interview on Wednesday of this week, Gallen wrote that their investigation into various labor claims, including allegations that owners of the Saki store confiscated passports of foreign workers on arrival, a claim that if true might have meant that employees were held against their will, should soon be completed. “Yes, we will pursue to criminal investigation if warranted from the immigration report,” he wrote. Bijlwan claimed that employees feared reporting any of the accusations he made in his email because they had been told that the foreign owner allegedly claimed to have influence through bribery and other means with government officials including FSM Attorney General Joses Gallen. Gallen said that he had no idea what would lead Bijlwan to make that claim. Gallen said that he is not a part owner of any Saki Stores and that he solely owns JG Stores with no partner. He said that he has no association with the owner of Saki Stores. One result of the investigation so far is that employees from India whose work permits had expired were repatriated to India but at press time, the Immigration and Labor investigation had not been completed. Bijlwan’s widely circulated email message which included copies of his contract, his expired entry permit, and his passport also included a link to a “warning” he had written on “blogspot” to other Indian workers considering employment with the store. That warning included several allegations not under the purview of Immigration and Labor. We could not confirm whether those allegations are being investigated. 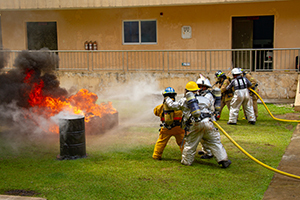 Pohnpei—As part of their ongoing training, Pohnpei’s Fire Fighters staged an emergency exercise in the courtyard of the government building in Peilapalap. Trainers had established a scenario for the training. The scenario they developed was that someone was trapped in a burning home. The firefighters were first to control the raging fire and then seek to find and rescue the trapped person. Meanwhile, the scenario said that one of the fire fighters was to be overcome by smoke inhalation and would require rescue and emergency medical response as well. The simulated house fire was set in several barrels containing a mixture of gasoline, diesel fuel and car tires. After the fires were lit, firefighters rushed in as a team to put out the stubborn flames. The water sources for the powerful hoses were two fire department vehicles and the hoses ran through the building. 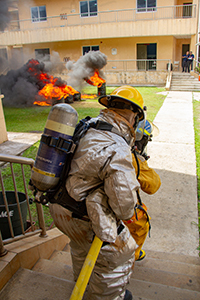 Once the flames were under control, emergency medical responders rushed in to treat and evacuate the mock victims who were each loaded onto ambulances at which point the exercise ended. Later in the day the fire fighters also participated in a vehicle extrication exercise where a mock victim was trapped inside a wrecked car. Carl says that the current training will continue through September and that once the training is complete, his Division of the Department of Public Safety will put the plan into place that would set up a 24 hour emergency response team in early October. 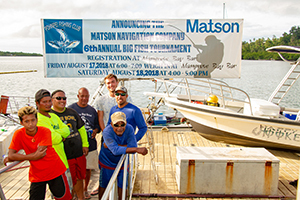 Pohnpei—The Matson Tournament was last weekend. We had a good turnout and there was a lot of fun out on the water, even though the big fish seemed to be hiding for most of the day. Some of our anglers were able to seek out and find some bigger fish. Matson and Amcres, our sponsors put up some great cash prizes, which were competed for very heavily. The awards ceremony took place after the tourney. Thanks to Mangrove Bay for supporting the weigh in. Also thank you to everyone who worked on the tournament and who helped out. We want to thank Matson and Amcres for being big supporters for the tournament. Support them and bring in some containers. We still have a few tournaments left this season, so get prepared. 20 August 2018 – The Federated States of Micronesia has become the first Pacific island country to complete a Joint External Evaluation (JEE). JEEs are voluntary, and involve a team of local and international experts working together to evaluate the country’s preparedness for outbreaks and health emergencies. This includes a set of core capacities required under the International Health Regulations (2005) (IHR) – a legally-binding international instrument signed by 196 countries across the globe, including the Federated States of Micronesia. The JEE process provides countries with recommendations on how to strengthen their national systems and address identified gaps, as part of an ongoing process of learning and improvement. 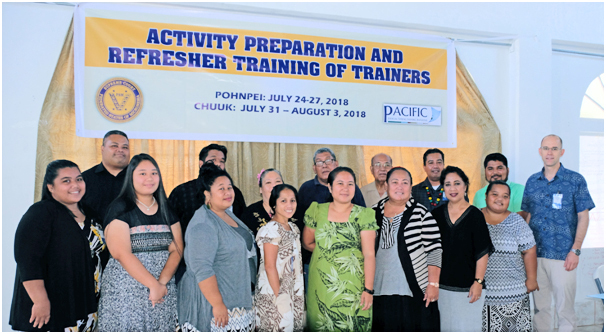 The JEE in the Federated States of Micronesia was conducted from 13-17 August and included experts in a range of disciplines including surveillance, antimicrobial resistance, risk communication, emergency management and biosecurity. WHO supported the country to prepare for the evaluation and ensure it was appropriately tailored to the Pacific island context, where geographically dispersed populations make delivering health services and managing emergency response operations logistically challenging and expensive. In the Pacific, WHO works closely with national authorities and regional partners to collectively prioritize, implement and fund sustainable national and regional health security capacities, guided by the Asia Pacific Strategy for Emerging Diseases and Public Health Emergencies (APSED III) and the Pacific Health Security Coordination Plan 2017-2022 (PaHSeC). These strategic frameworks support countries and partners to take collective action to accelerate implementation of the IHR at national and regional levels. Other countries in the Western Pacific Region that have conducted a JEE include Australia, Cambodia, Japan, the Lao People’s Democratic Republic, Mongolia, the Republic of Korea, Singapore and Viet Nam. WASHINGTON – Doug Domenech, U.S. Department of the Interior Assistant Secretary, Insular and International Affairs, this week approved $1,345,256 in fiscal year 2018 grant funding under the Coral Reef and Natural Resources initiative to the U.S. territories and the freely associated states. Office of Insular Affairs Director Nik Pula was in American Samoa this week to co-chair the 40th U.S. Coral Reef Task Force Meeting where he announced the funding. American Samoa Coral Reef Advisory Group - $173,200 to restore and rehabilitate coral reefs at the Ofu-Olosega islands in American Samoa that have been damaged by an algae outbreak of Valonia fastigiata. Project managers will be working closely with the National Park Service. Commonwealth of the Northern Mariana Islands Bureau of Environmental and Coastal Quality - $166,949 to support several projects including 1) participation in the U.S. Coral Reef Task Force Meetings; 2) Laolao Watershed Management Plan Development; and 3) the Coral Nursery Development Project. Guam Bureau of Statistics and Plans - $220,231 to support several projects including 1) Marine Tour Operator Workshop; 2) Coral Reef Management; 3) Coral Reef Conservation Outreach and Education; 4) Removal of an invasive bamboo plant, Bambusa vulgaris from priority watershed areas; 5) the Tasi Guides Program; and 6) the geotechnical investigation of rainfall-induced landslides in Piti-Asan watershed. U.S. Virgin Islands Division of Coastal Zone Management - $122,791 to support coral restoration and coral nursery operations, and 2) participation in the U.S. Coral Reef Task Force Meetings. Women’s Aquaculture Farming Initiative, Republic of the Marshall Islands - $134,582 to support a Women’s Coral Farming initiative in Mili and Arno Atolls to grow hard and soft corals for local use and to ensure protection of wild coral reef resources. The Hawai’i State Museum of Natural and Cultural History and the Palau International Coral Reef Center - $185,503 to establish biology-based regulations for the sustainable harvest of reef fishes in the Republic of Palau, build research capacity in Palau to develop the sustainable use of coral reef fishes, and help meet the subsistence and artisanal fishing needs of Palau residents. 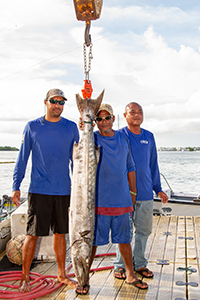 Mariana Islands Nature Alliance - $142,000 to support the Tasi Watch Ranger Program which was developed to build and strengthen CNMI youth and community’s involvement in management of coastal and near-shore marine resources. This project includes efforts to remove invasive tangan tangan trees, leucocephala, and restore native species of trees and plants that were lost during Typhoon Saudelor in 2015. Earlier this year, $200,000 was provided to support the 2018-2020 National Coral Reef Management Fellowship Program in American Samoa, Guam, the Commonwealth of the Northern Mariana Islands, and the U.S. Virgin Islands. Funds are made available through the Department of the Interior’s Office of Insular Affairs’ Coral Reef and Natural Resources Initiative. Applications are generally submitted from October through May 1st each year. Funds are awarded once OIA receives appropriations from the U.S. Congress until they are exhausted. The Assistant Secretary, Insular and International Affairs, and the Office of Insular Affairs carry out the Secretary of the Interior’s responsibilities for the U.S. territories of Guam, American Samoa, the U.S. Virgin Islands, and the Commonwealth of the Northern Mariana Islands. Additionally, OIA administers and oversees Federal assistance under the Compacts of Free Association to the Federated States of Micronesia, the Republic of the Marshall Islands, and the Republic of Palau. OIA supports the Secretary's mission of Fulfilling Trust and Insular Responsibilities through balancing efforts and limited resources towards stronger economic and health capacities, and fiscal accountability in the U.S. insular areas. Global flight safety standards for contracted aircraft operators have been updated to include air drop threats, controls and defences in a collaboration involving the Flight Safety Foundation, air operators, humanitarian organisations and facilitated by the World Food Programme (WFP). Air drops are occasionally used by humanitarian organisations like WFP to deliver food and other basic supplies to remote areas. Version seven of the new Basic Aviation Risk Standard (BARS) Program also includes the addition of safety goals at the top of each control and defence, providing industry with the ability to establish measures to rate the organisation’s safety performance against each goal. The BARS Program was created by the Flight Safety Foundation (FSF) in collaboration with some of the world’s largest resource and mining companies to provide a more efficient means of monitoring, assessing and analysing risks associated with contracted aviation operators. FSF BARS Program managing director David Anderson said the inclusion of air drop risks and controls in the latest version of the Program responded to the continued rise in global humanitarian activity and the unique challenges involved in these operations. “Air drop activity has its own unique set of risks and controls and is very different to other aviation operations, which is why we’ve dedicated an entire appendix in this latest version of the BARS Program to these activities,” he said. Mr Anderson said the other significant update in the latest version of the BARS Program was the inclusion of safety goals – a result of industry feedback from resources, mining, construction and insurance organisations that contract aircraft and helicopter operators. “No other standard has ever outlined ‘why’ a control is in place – the addition of safety goals to each control and defence in the standard is a significant step forward for our industry,” he said. Mr Anderson said before the BARS Program existed there were no clear benchmarks for companies to assess the safety of their own, or outsourced, air operations. This created multiple audit levels that were carried out with no information-sharing or comparability between companies. “Over the past seven years, the BARS Program has done more than 550 audits in 33 different countries for about 170 different aircraft operators,” Mr Anderson said. 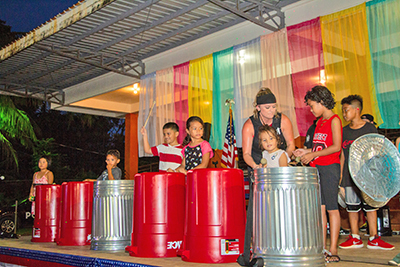 FSM—Sponsored by the US Embassy to the FSM, the unique band “Vocal Trash” blew through three states of Micronesia in a whirlwind tour spreading their environmental message where ever they went. 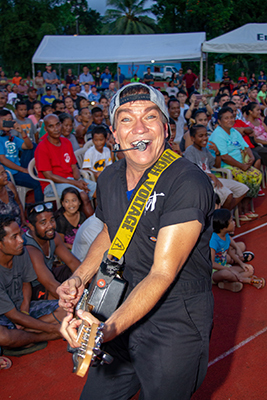 The band’s high energy performance, even in the blazing heat and high humidity of Kosrae, Chuuk, and Pohnpei was infectious. Led by Kelsey Rae and Steve Linder, the band includes Grug Dugan, Anthony Silva, and Pablo Barragan. They were all consummate performers inspiring audience participation throughout their performances. Banging on water bottles, trash cans, and even the stage floor; playing a guitar whose body was a Dewalt power tool case, break dancing, and even tap dancing every song, every message encouraged their audiences to actively work to preserve the earth. They likely had more impact on the problem of littering in one hour and a half performance than KPress has had in over 16 years of editorials. They were hard not to love though no one seemed to try wherever they went. Pohnpei—Governor Marcelo Peterson and LianCheng Overseas Fishery FSM Corporation, Luen Thai Fishing Venture represented by Deng Lu today signed settlement agreements on the long standing civil actions between the State and Luen Thai. 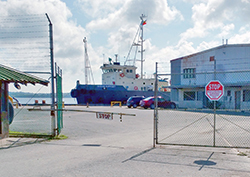 They also signed an agreement for Luen Thai to lease land on Pohnpei Port Authority property, as well as an agreement to begin a tuna farming pilot project in Pohnpei waters. Governor Peterson called the moment an important event for Pohnpei Economic Development. Luen Thai currently employs approximately 100 people in Pohnpei. Deng says that the new agreements will pave the way for at least 100 more jobs that don’t currently exist in Pohnpei. The Governor and Deng said that the pilot program for tuna farming would be in waters near the APSCO dock in Sokehs. The Mackerel Tuna (Euthynus affinis) that would be raised there, if the project is successful, would be exported as fresh high grade sashimi quality. Deng said that the current market value for sashimi grade Mackerel Tuna in the Japanese market is at just over $16 per pound varying with exchange rates. The settlement documents and Lease Agreement were accompanied by a memo to Governor Peterson from Pohnpei Attorney General Dana Smith who explained each element of the agreements. Pohnpei—Pohnpei has filed criminal charges against two Nukuoro employees related to theft of nearly $18,000. The charges came after a Pohnpei Office of the Public Auditor review of the municipality revealed financial irregularities that were then handed over to the Compliance Investigation Division, which after investigation referred the matter to the Pohnpei Office of the Attorney General. The charges were filed at the Pohnpei State Supreme Court on the evening of July 27. Itaia R. Fred and Blumina Leopold were charged with the crimes. Their arraignment is scheduled on August 17. Both are presumed innocent unless otherwise proved in court. At press time they had not yet entered their pleas. Both of the defendants are charged with grand larceny, theft by failure to make required disposition of funds received, cheating, misconduct in public office, and compounding a crime. According to the filed charges, Fred is the chief representative of the Mayor for the municipal government of Nukuoro. Blumina Leopold is the Assistant Treasurer for the Nukuoro government. The charges against Itaia, who has already been convicted of felony charges on a plea bargain for a financial crime involving the Office of Fisheries and Aquaculture where he currently works, is accused of stealing over $14,000 from the people of Nukuoro over a three year period. Editor’s note: Just before print deadline, Fred and Leopold pled “not guilty” to all charges. The trial will resume on September 14. FSM—Sometimes you meet a person whose accomplishments are so numerous and astounding that it’s hard to wrap your mind around all that they have done. Dr. Orhan Kural of Turkey is that kind of man but because of his personality, I didn’t know the extent of it until I looked at his website (www.orhankural.org). He came into my life when he walked through my office door carrying a backpack and dragging a suitcase on Friday. He introduced himself and then proceeded to pull publication after publication from his suitcase and backpack, a small sample of books he had published. He told me that he is a world traveler and had been told by someone on his journeys to look me up. His business card lists as a Lecturer of Istanbul Aydin University, Honorary Consul of Republic of Benin, Vice Honorary Consul of Vanuatu, President of Turkish Travelers Club of Turkey, and the President of the Association of Yellow Crescent. All of those titles are just a hint of what Dr. Kural is about. To say that he is a world traveler is to understate the matter in the extreme. During his current trip he visited the Republic of the Marshall Islands, and of course, the Federated States of Micronesia. After departing from the FSM he traveled to Tuvalu, and Nauru. They were the last four countries he needed to have visited in order to have visited all 193 countries recognized by the United Nations. The number of countries a traveler has visited is one way to talk about how extensively one has traveled but another, better way is by region. The Nomad Mania site divides the world up into 1281 regions, the idea being that, for instance, spending a day in New York city does not mean that at a traveler has actually visited the United States. Before Dr. Kural’s current trip he was ranked as the 41st most traveled person, having visited 764 of the 1281 regions. That ranking is likely to go up after this journey during which he will also visit Saipan which, as a US Territory is not one of the 193 UN countries. Palikir, Pohnpei—During the Fifth Special Session of the 20th FSM Congress, Chuuk’s Senator Robson Romolow introduced a resolution (C.R. 20-119) regarding the upcoming referendum for his State to secede from the FSM. The resolution did not reach the floor of Congress for consideration during the short fifth special session but is still open for consideration in a future session. The proposed resolution asks the 20th Congress of the FSM to request the Governor of the State of Chuuk to reconsider moving forward with the referendum related to Chuuk’s secession from the Federated States of Micronesia. MENEN, NAURU—At the 13th Annual PNA Ministerial meeting from August 1-2, PNA Ministers noted the continued success of the PNA purse seine Vessel Day Scheme (VDS). The PNA controls the fishing grounds in which about half of the world’s tuna is caught and the VDS has helped to increase PNA member fishery earnings from $60M before its implementation to $470M in 2017. The VDS has also contributed to sustainable management as all major western and central Pacific Ocean tuna stocks were found to be healthy in 2017. PNA Ministers adopted several key measures designed to strengthen the economic and environmental performance of the region’s tuna fisheries, including the endorsement of a PNA Electronic Monitoring (e-moniotring) Program. This will build on a sub-regional E-Monitoring initiative spearheaded by the Federated States of Micronesia, Marshall Islands, Palau, and Solomon Islands. E-Monitoring leverages advanced technology including video cameras to fill critical science and compliance monitoring data gaps in the region’s tuna fisheries. “This is a very positive step for PNA to take leadership in the development of the E-monitoring program for not just the PNA but also the region given more than half of the longline effort occurs in the high seas which has a poor record of monitoring and compliance. The installation of camera’s would improve validation of the catch and improve monitoring particularly of species of special interest” says Eugene Pangelinan, Executive Director of FSM’s fisheries agency. The prohibition on high seas bunkering was also adopted by the PNA Ministers. In this respect, all purse seine vessels licensed to fish in PNA waters will be prohibited from bunkering (re-fueling) in the high seas starting Janurary 1, 2020 as this activity increases the risk of illegal, unreported, and unregulated fishing. Lastly, Kiribati joined the PNA longline VDS, joining the seven PNA members and Tokelau in the initiative, which was launched in 2014. Tokelau also joined the FSM Arrangement widening the operational area of the domestic fleets of PNA members. Palau will host the next PNA Ministerial in 2019. On July 31, 2018, nine (9) students of the College of Micronesia Trial Counselor’s program received their certificates of completion, before a gathering of special guests, family members, and supporters. The ceremony was held at the FSM Supreme Court in Palikir. The certificate program provides training opportunities for current, as well as aspiring and upcoming trial counselors, to improve their skills and competency, and to prepare them to be effective decision makers in their respective courts. The program also provides for networking and sharing among trial counselors, and those interested in entering the legal field. Graduates have also gone on to further their legal studies in China, Vanuatu, and the United States. During the ceremony, the opening prayer was given by Reverand Taylor Elidok, and opening remarks were made by Karen Simion, Vice President of Instructional Affairs, who gave an overview of the program. The keynote address was delivered by Jackson Smith, who was one of the graduates, and is the Chief Justice of the Sokehs Municipal Court. Chief Justice Smith addressed the graduates by emphasizing the importance of a legal education, and the need to work toward a common good. The certificates were presented to the graduates by Karen Simion and Associate Justice of the FSM Supreme Court, Beauleen Carl-Worswick. The closing remarks were given by Daniel Rescue Jr., General Counsel of the FSM Supreme Court. Mr. Rescue discussed the special partnership between the College of Micronesia and the FSM Supreme Court through the administration of the Trial Counselor’s program, a relationship that has been in existence for nearly twenty (20) years. Special guests also in attendance were: Joseph Habuchmai, COM Vice President for Administration, Maria Dison, Dean of Academic Programs, Dr. Denise Oen, Director of Institutional Effectiveness, Delihna Ehmes, Professor for Social Sciences Division, Joseph Felix Jr., Instructional Coordinator for the National Campus, Eusepio Hadley, Associate Justice of the Sokehs Municipal Court, and Dickson Martin, Temporary Justice for the Kolonia Town Court. The following are the 2018 graduates of the College of Micronesia Trial Counselor’s program: Hiteharu Augustine, Floriano Bonapart, Tamara Tara Booth, Mayleen David, Semenster Hadley, Stevick Joseph, Helen Paul, Michael Reyes, and Jackson Smith. Front row: Daniel Rescue Jr. (General Counsel of the FSM Supreme Court), Emeliana Musrasrik-Carl (Director of Court Administration), Delihna Ehmes (Professor for the Social Sciences Division), Beauleen Carl-Worswick (Associate Justice of the FSM Supreme Court), Karen Simion (Vice President of Instructional Affairs), and Joseph Habuchmai (Vice President of Administration). Back row: Semenster Hadley, Tamara Tara-Booth, Floriano Bonapart, Mayleen David, Hellen Paul, Hiteharu Augustine, Jackson Smith, Stevick Joseph, and Joseph Felix Jr. (Instructional Coordinator for the National Campus). Missing, Michael Reyes. Colonia, Yap- During the 2018 Micro Games, among the hundreds of volunteers who pitched in and provided support was a group from Mormon Helping Hands, the community service organization of The Church of Jesus Christ of Latter-day Saints. In addition to a group from the church’s two local Yap branches located in Colonia and Thol that helped clear out desks, chairs and other furniture from the schoolrooms at Yap High School before it was turned into the athletes village, a team of media and technical experts arrived from Japan, Korea, Guam and Pohnpei to make sure fans from around the region and the world could cheer on their favorite athletes from afar. The all-volunteer group brought equipment along with their expertise and worked with local volunteers to set up live streaming of the Games. They also took photos of the competitions that were posted online and shot videos that are now being edited and will be uploaded to YouTube. Then, when the two-week-long quadrennial event came to a close, they left three new laptops with an offer to donate them to a worthy organization in Yap. LDS District President, Jim Hachigeiresh, presented the laptops to OurYAP representatives Michelle Chugen and Joshua Libyan in the presence of John G. Mangefel, Yap State Department of Youth Services. With this donation, the young members of OurYAP can now realize their own mission of service, as well. John G. Mangefel, Yap State Department of Youth Services; Joshua Libyan and Michelle Chugen, Our YAP; Jim Hachigeiresh, District President, The Church of Jesus Christ of Latter-day Saints. Participants of the workshop received training to develop their confidence in leading, designing, delivering, monitoring and evaluating ongoing judicial and court development activities. The practical and interactive workshop also focussed on developing adult learning skills to help the FSM Supreme Court to implement its newly developed Access to Justice Plan and associated training in each State. Participants also took the opportunity to showcase traditional and cultural practices and the paying of respect in engagement activities. On Monday, July 30, 2018, a tugboat entered the harbor off Colonia; it was identified as the “Mtug OCEAN SUPPORT”, a vessel owned by Fahrenheit Co. Ltd. that was intended to tug along the MV Forever Lucky and cargo meant for the 2018 Micronesian Games. Upon arrival, the vessel was denied by immigration and quarantine authorities, citing lack of an entry permit. The tugboat has been quarantined at the eastern end of the port, with its 16 Philippine nationals charged with immigration violations. The FSM National Police has signed an affidavit in support of the injunction served to the vessel’s captain and Fahrenheit’s representatives. It appeared that the National Police officer who signed the affidavit was not familiar with the content of the affidavit. On Wednesday, August 1, the Governor communicated to the FSM President of the issue, requesting assistance in providing clearance for the vessel. The letter also thanked the FSM National Government for contributing to the successful hosting of the 2018 MicroGames in Yap. In the letter, Governor shared that while an entry permit was issued for the Forever Lucky on June 9, one was never issued for her tugboat. The Forever Lucky was eventually released by the Philippine authorities, but was too late to arrive in Yap for the Games. As for the tugboat, state authorities did submit the necessary documents requesting for an entry permit from FSM Immigration & Labor on July 9, with a follow-up communication on July 23. But an entry permit was never issued, or any denial of an entry permit communicated. These communications were forwarded to the Secretary of Justice on August 2, 2018 in response to the Secretary’s e-mail that there was no communication to his Immigration staff regarding the tugboat. In response to this e-mail, the Secretary stated that he would verify this with his staff and respond as soon as possible; but to date, the State has not received any further response. The tugboat left the Philippines late and arrived late on July 30 due to inclement weather, bringing freezer container cargo and other donated goods meant for the MicroGames. According to the Yap State Department of Resources & Development, Fahrenheit was issued a Foreign Investment Permit in May of this year; allegations of illegal business were false. It was also shared that while the Forever Lucky was detained in the Philippines on allegations of human trafficking, human smuggling and illegal documentation, ultimately there were no formal or informal warrant or complaint against Fahrenheit and the Forever Lucky by Philippine authorities, as falsely reported by some members of the press. Currently, the tugboat’s crew are not permitted by FSM Immigration to disembark the vessel. Additionally, the shipping agent and state officials are not allowed to board the vessel. The Governor in his letter urged the President to assist in the matter for “humanitarian reasons as well as our future urge for foreign investment”. The letter further stated that the State will continue to collaborate with the FSM National Government on the clearance of the vessel and its cargo in accordance with FSM laws and regulations, “as we did before the games”. The Yap State Government has not been part of any media releases being published lately in various media platforms, as it continues to identify with the National Government certain oversights that may have directly or indirectly contributed to the overall misunderstanding. The State Government is in the process of affording appropriate actions toward the release of unverified information and claims that are promoting falsified and compromising information to the general public. Colonia, Yap- Eighteen students from across Micronesia will enroll in respected private schools this fall with the help of Habele tuition scholarships. Attendance at these schools dramatically increases the likelihood that these children - residents of some of the most remote communities on earth - will complete a K-12 education. Since 2006, Habele has partnered directly with families, schools, and local stakeholders to ensure that bright, hardworking students have access to the best education possible. These tuition scholarships are funded entirely by individuals with a deep commitment to children in underserved Micronesian communities. 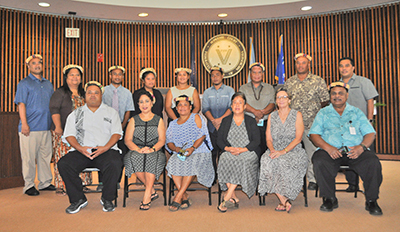 The students, whose families come from isolated islands and atolls throughout Yap and Chuuk States, have been awarded tuition assistance covering 75 percent of the cost of their 2018-19 enrollment. They will be attending top-ranked, independent K-12 schools on the islands of Yap, Chuuk and Pohnpei. Most will live with relatives or sponsors for the length of the school year. The far-flung islands of the Federated States of Micronesia (FSM) are renowned for their natural beauty, as well as their strategic location in the crossroads of the Pacific. Extreme isolation and limited natural resources remain a struggle for the nation, despite decades of direct financial aid from the United States government. These huge sums have failed to translate into broad educational access or measurable education success for most Micronesian students. In this void, Habele continues to demonstrate the real impact that comes through targeted investment with local buy-in. In addition to the funding tuition scholarships, Habele provisions public school libraries across the FSM, supports traditional skills instructional programs, and facilitates the only high-school robotics league in the Western and Central Pacific. Established by former Peace Corps volunteers, Habele is a US-based nonprofit, advancing educational access and accomplishment in Micronesian communities. 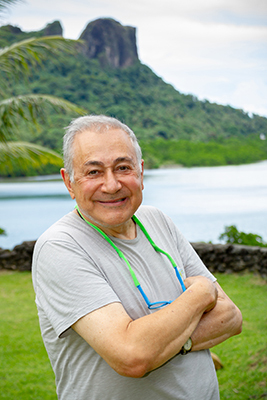 I write this letter because of the vagueness and woefully inadequate response from Sabino Asor, the principal strategist of the Chuuk secession movement, to former Speaker Jack Fritz’s statement. Mr. Asor claimed that the establishment of the Chuuk State Political Status Commission is not unconstitutional because it was established by the Chuuk state legislature like any state institutions in Chuuk such as the Board of Education. He was wrong to compare the establishment of the political status to the creation of the Board of Education. First, the establishment of the political status commission violated Section 3 of Article XIII of the FSM constitution. The FSM constitution is the supreme law in this country, and that an act of the Government in conflict with this (FSM) Constitution is invalid to the extent of conflict (Section, Article II, FSM Constitution). The establishment of the Chuuk political status commission by the Chuuk state legislature is an act of a government in the FSM that contradicted Section 3 of Article XIII of the FSM constitution, and therefore, the creation of the CSPSC is unconstitutionally ab initio. Second, in establishing the Board of Education the Chuuk State Legislature acted within the legal parameters of its constitutional power granted to the states by the FSM national constitution. (See Sections 1 and 2 of Article VIII of the FSM Constitution and Edward v. Pohnpei, 3 FSM Intrm 350, 357, Pohnpei: 1988). In comparing the unconstitutionality of establishment of CSPSC to the unquestionably constitutionally created state Board of Education is tantamount to comparing oranges to breadfruits. In other words, this comparison is bizarre. In his most recent posting on Facebook, Mr. Asor sets out the proposed timeline for Chuuk separation from the plebiscite to withdrawal of Chuuk from the FSM to complete independence. On his proposed timeline of events, Sabino Asor allotted a segment of that timeline to negotiation with the United States and FSM regarding the division of the Compact Trust Fund. What is there for Chuuk State Political Status Commission to negotiate? In the first place, and unlike the other three states, Chuuk failed to pay its contribution to the initial capitalization of the FSM Trust Fund. Second, the US Ambassador Riley, the highest US government representative in the FSM and personal representative of the US president, has said that if Chuuk secedes then it would not be eligible to receive any fund from the FSM Trust Fund. Mr. Asor has contradicted Ambassador Riley’s statement. Who should we believe, Ambassador Riley, the highest ranking US diplomat in the FSM who represent the US president with full authority to speak for the US government or Sabino Asor a member of the Chuuk State Political Status Commission? I do not need to tell you who you should believe and trust, but I can warn to watch out of a false political prophet with tons of arrogance of power. Mr. Asor also included a segment on his timeline of events for negotiation with the FSM for boundary. I presume Mr. Asor wants to negotiate Chuuk boundaries with Yap state in the west and Pohnpei state in the east. The current boundary among the states in the FSM is set by laws that apply the principle of equidistance (See FSM Constitution, section 2, Article I). I wonder what Mr. Asor had in mind. Does he want to expand Chuuk boundary westward into the outer islands of Yap and eastward into Pohnpei.